This year when you share the love, make it personal. 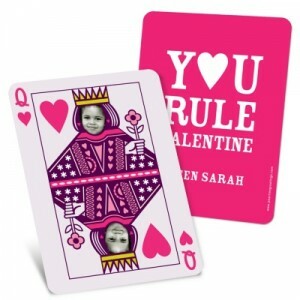 Our custom Valentine’s Day photo card ideas put your child’s smiling face at the heart of things, right where it should be. After all, Valentine’s Day is an opportunity to say “I love you,” and that message should come straight from the heart. 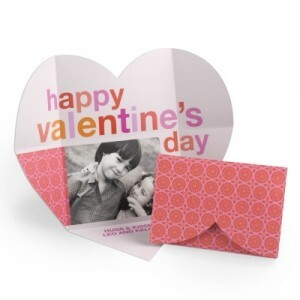 Our Valentine card ideas include special shapes, like the folded With All Your Heart Valentine’s Day photo cards, that opens to reveal a photo inside. Or the Cutie Pie Ribbon Strand Valentine’s Day Photo Cards family will love to display. You can send a Love Coupon for a free hug to family and friends. Or make your child a Queen for a Day or a Space Alien by inserting their photo into our fun classroom valentines for kids to exchange at school. It couldn’t be easier. Best of all, you can order in small quantities, if you like, for just a few friends and relatives, which makes custom Valentine’s Day photo cards affordable as well as personal. Start shopping today, or read on for more valentine card ideas.